Automatic blinds are similar to other blinds in regards to the materials used to make them. Like ordinary blinds, these will often get dirty and dusty and have to be cleaned like all other objects in your home. Here are some useful hints to keep your window blinds clean, and to avoid hazards while attempting to clean them. 1. Use the brush attachment on your vacuum to clean. Using the vacuum cleaner on your blinds is possible, so long as you use the included brush attachment, and not try to lift the whole vacuum up. Attaching the brush to your nozzle and then reaching this nozzle up will do a safe and effective job of sucking up dust that is collected on your motorized vertical blinds. Do not worry if you are afraid that your vacuum's suction may damage your blinds; it is not forceful enough to do so. Vacuuming with a brush attachment is also one of the most recommended ways to clean your blinds if they are made of fabric. 2. Keep your blinds free of blemishes with lamb's wool. An ideal way to maintain a flawless look for your motorized blinds is by dusting them on a regular basis. Instead of going for a plastic duster, however, opt to use a duster made of lamb's wool. Start from the top, dust across the slats, and work your way to the bottom. Working from the bottom to the top will mean that you will get dust on the clean lower slats of your blinds. For motorized vertical blinds, dust each slat individually. Start from the top and work your way down to the bottom. On the next slat over, start at the top again. 3. Remove dirt and dust from vinyl or fabric blinds with a rubber sponge. 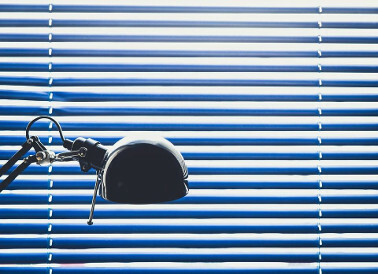 If your blinds, by any chance, have not been cleaned for a long while, they may be noticeably full of dust that may take a lot of time or force to get off of each slat. This is especially true with blinds that are made of vinyl or fabric. To effectively remove a lot of dust, you can purchase a rubber sponge from your local hardware store. What these sponges do is grip the dust on the blinds and remove them with force that does no harm to the slats or blinds. What is especially neat about these sponges is that you do not need to add water or soap, like you would for a regular sponge. 4. If you want to wet your blinds, remove them first. You should know by now that electronics plus water equals major harm. Play it safe and never use water on installed motorized blinds, for it may short circuit the receiver, causing the remote controls to no longer work. If you can, remove each slat from your blinds before using water to clean them. This way, you can effectively clean and dry them before putting each one of them back on. If your slats are stiff and feel like sticks as you bend them, think twice about using water to not bend or crease any of these slats. For flexible blinds, you can take them and wash them outside with a hose or bucket, or fill a bathtub with water and let them soak in there. Wash these slats using clean water, soap, and a soft cloth or sponge. After washing the slats, dry them with a soft towel and then leave them to completely dry on their own so that there is no water left on them. When fully dry, place them back on your blinds.